We understand it is critical to keep your report layout pixel perfect. Sometimes, it can be challenging, because you and your colleagues view those reports on screens with different aspect ratios and sizes. The default display view is Fit to page and the default display size is 16:9. If you want to lock in a different aspect ratio, or want to fit your report in a different way, there are two tools to help you: Page View settings and Page Size settings. Page view settings are available in both Power BI service and Power BI Desktop but the interface is a little different. 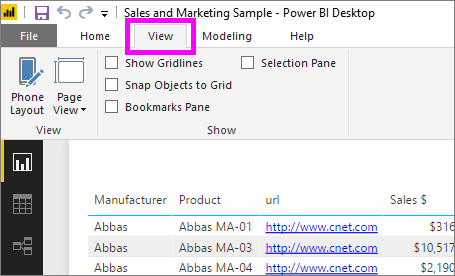 The two sections below explain where you can find View settings in each Power BI tool. In Report view, select the View tab to open Page view settings as well as phone layout settings. In Power BI service, open a report and select View from the upper left menubar. Page View settings are available in both Reading view and Editing view. In Editing View, a report owner can assign page view settings to individual report pages, and those settings are saved with the report. When colleagues open that report in Reading view, they see the report pages display using the owner's settings. In Reading view colleagues can change some of the Page view settings, but the changes are not saved when they exit the report. Page Size settings are only available for report owners. In Power BI service (app.powerbi.com), this means being able to open the report in Editing view. These settings control the display ratio and actual size (in pixels) of the report canvas. 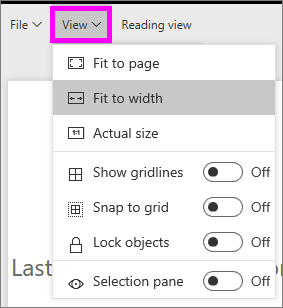 Learn how to use Page view and Page size settings in your own Power BI reports.